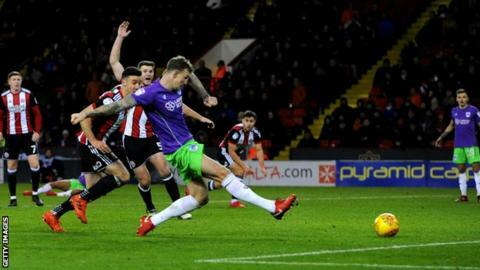 Defender Aden Flint is becoming an "icon" at Bristol City, says the in-form club's head coach Lee Johnson. The 28-year-old volleyed in his sixth goal of the season on Friday to give the third-placed Robins a late win at Championship rivals Sheffield United. Since his 2013 arrival from Swindon, Flint has netted 34 league goals, but nearly left Ashton Gate in August. "He's been excellent. Every time he's in the area, he causes a problem," Johnson told BBC Radio Bristol. "He's scored so many goals, he's fast becoming a real icon for the football club." Flint said in October that he had not expected to play for the club in September, yet he won that month's Championship player of the month award. Asked how much Flint might be worth now, after bids from Birmingham City for the 6ft 6in centre-back were rejected in August, Johnson replied: "We don't want to think about that, we want to keep him. "We managed to keep away the distractions in the summer, and we've kept him in now. To score as many goals as he does, he's like a magnet." Meanwhile, Johnson said midfielder Korey Smith will be assessed after he was withdrawn following a challenge from John Fleck, which saw the Sheffield United man sent off. Robins striker Milan Djuric is also set for a groin operation and a subsequent spell on the sidelines, having required injections to play on Friday. "Korey's got a nasty gash down the shin," Johnson added. "He's struggling to put weight on it. "Milan is booked in for an operation on 18 December. We'll try and get him back within three and five weeks. "We are winging it a little bit, having to adapt slightly too much, just because of the people that we've got hanging in there. It's credit to the warrior spirit the club has got." Johnson's side are also without striker Famara Diedhiou (knee), winger Callum O'Dowda (ankle), full-back Eros Pisano (hamstring) and midfielders Jens Hegeler and Gary O'Neil (both knee).